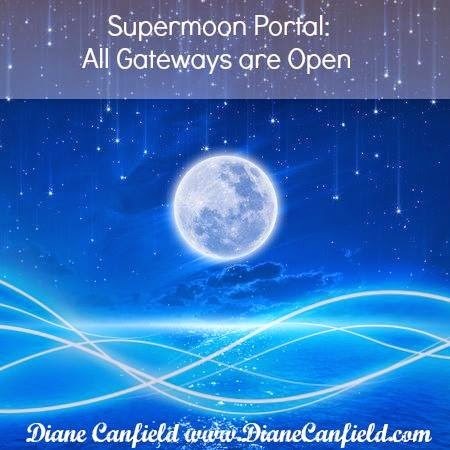 We are approaching a time of increased energy waves as the Supermoon on September 9th provides us with increased awareness when we are at the stage in the ascension process where we can be aware of the higher expansions and what this feels like energetically. This actually can take place anywhere from the 7th to the 12th as this is just like other energy portals as in the equinox and solstice. These people that are more sensitive will feel more and be more tuned into the Universal energetics. For those that are not as aware this is still a step in the ascension process, it just goes on at an unconscious level but they too are now in the awakening process. They will also benefit from this expansion as will every being on the our beautiful Gaia. During this time of increased awareness and intensity we may feel far more sensitive and feel the energies of the Universe. When these portals are open we are much more receptive to receiving messages from other realms. This will also include the lower realms, so we must be sure and stay in a positive state of mind and not manifest anything negative to ourselves or others. When these portals are open we are much more likely to receive messages from the higher realms that will help expand our soul consciousness and our true Divine nature. We want to receive only the positive expansions that are possible for us to receive. We will also heal ourselves spiritually during this time and this will help us heal ourselves in every aspect since all things start in the spiritual realm and then work their way to the physical realms. We need to have access to the spiritual realms during this time and try to stay tuned to this realm as much as possible. I go into more detail with how to do this in my consciousness expanding and third eye opening classes here. The 3D worlds call to us everyday to be involved but during this time we want to take as much spiritual time for ourselves as we can to maximize the higher awareness portals that are now opening to us. We need to go to our sacred space and become attuned to the higher dimensional awareness. If we do not have a sacred space this is a good time to create one and any space that is all yours will do in a pinch. My entire house is a sacred space to me but everyone may have their own sacred space which can include nature areas and the entire Universe. The Universe itself can be looked at and deemed a sacred space. The ascension and our higher awareness calls us to not get stuck in the past. This will even include what happened in ascension because this keeps us looking backwards and not being fully in the present moment. There are others who will talk about things that are related to ascension in the past. This is a mistake because we need to only focus on the here and NOW. This is where our energy exists. We do not want to be taken to the past mentally as this interferes with our consciousness in the NOW. There would only be exception to this if an actual life changing experience was to have taken place, for instance my near ascension experience about a year ago. This changed my whole ascension experience as I was then propelled into the higher realms where I still exist. The present moment, the NOW moment is actually where everything is taking place and where it will take place as we keep ascending. This moment can only be accessed if we are giving our full attention and being to it. You may feel when you read something, as in going back to the past an uneasy feeling energetically. Pay close attention to these feelings. FEELINGS are the PORTAL to everything energetically. This is how we move dimensions by paying attention to how we feel, adapting to the downloads and DNA changes coming in and then by adapting to them. The very first step is to FEEL them. Western Society does not put a high regard for feelings but in other realms and real realities that are not based on illusions, feelings are ALL that matters. We can access these other realities based on what is important there, by doing the same thing in this reality. We may need to work to move past the programming that has taken place to be able to access our feelings fully. Higher chakras activations, and instant manifestations. As I said earlier, keep all your manifestations positive because even lower level manifestations can now manifest. 13 but some of us have already passed these higher points and are working on our chakras above these points. There is no end to these crown chakra activations, our chakras go all the way up to Divine Consciousness. When we move into these higher states of consciousness, our awareness increases and we merge to even higher levels with our Creator and we see more and more of reality for what it really is. This brings us into alignment with the ONE TRUTH and expanded knowledge. Since our Creator is the ultimate Divine Truth, we have more and more access to this TRUTH. This helps us in every aspect of our lives because we can then see the bigger picture in every situation. We can FEEL when someone is telling an untruth. This means that when you are ascending you will have less and less patience for the untruth. You may feel sick when you hear it, you will instantly know this is not the truth and does not line up with your being of light and love. This is the light of our Creator, Jesus and the Christ Consciousness that these beings of unconditional Love bring into us. This took place instantly for me when I experienced my near ascension experience over a year ago. I could no longer read any messages from anyone that did not resonate with the Truth. If you are experiencing this it means you have reached a higher level of awareness. This is the goal of ascension to reach the highest levels of truth we can and to manifest truth for ourselves. When we are in the higher levels of ascension, we will no longer have patience for anything that does not align with the truth, We turn our heads and walk away from it. Not causing drama or chaos, just not engaging with lower vibrational attitudes or beings that still want to carry the vibration of drama and chaos. We choose to keep our vibration high and to work to maintain this higher vibration of light and love. We KNOW we are ascending. We feel it with every fiber of our being. This is how we are living in the moment of NOW and we look forward to all signs and symptoms as they come are way. We embrace ascension for everything that it offers to us and to the others we love. We know this is our destiny and our call out from our higher selves to engage and become more and more active in the process. We are in charge of our OWN ascension process. We are the ones helping to creating this masterpiece in association with our Star SiStars and Brothers, the Sun, the Central Sun, the waves from the photon Belt and the Divine Creator. We are intimately involved in this process and choose to participate at this time. IT IS OUR DECISION. We are Love and that is what we do best, LOVE. A article about the Altarians that have visited me and their message to me. I will cover the exact circumstances of their visit and what it means. This is one of the many races I am visited by. How to manifest weather changes yourself. I have been doing this for quite some time. I will go over the techniques I use to accomplish this. A channeled message received today from the Et Council that I work with that makes up many different races of Et’s that have visited and contacted me in person about ascension and our progress.